What ever happened to the brass car revival? Thread: What ever happened to the brass car revival? 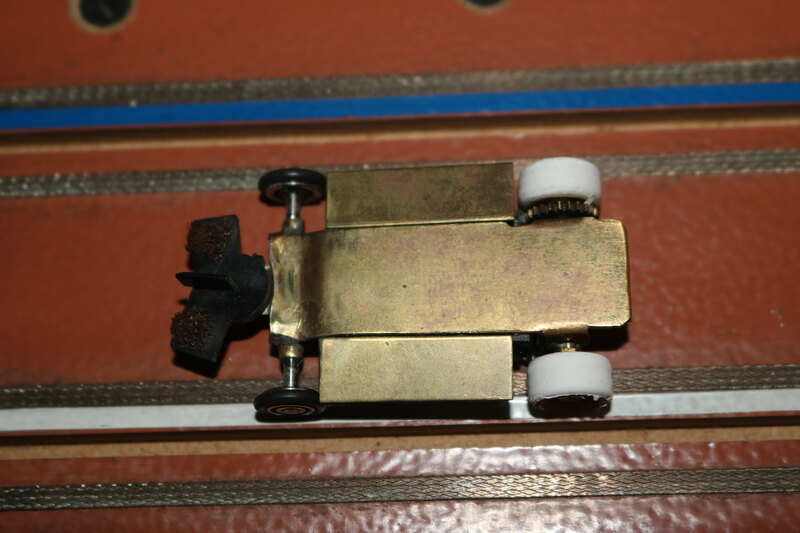 I've always been interested in the brass cars of the 70s and have been away from the hobby for a couple of years just when the new Riggens came out and then the Landshark. What happened with this class and who is out there racing it? I guess it's now called the gravity class. Injection molding made the companies more money. Al Thurman is still making and promoting Landshark cars. I'm not sure if he comes here much. I suggest contacting him on FB if you are interested in whats going on with that genre of racing these days. Thank you Mike. That's just what I was looking for. Years back it seemed much busier here. Larry, don't let that 50 year pin get dusty. Last edited by ejeff; 05-06-2017 at 01:02 PM. 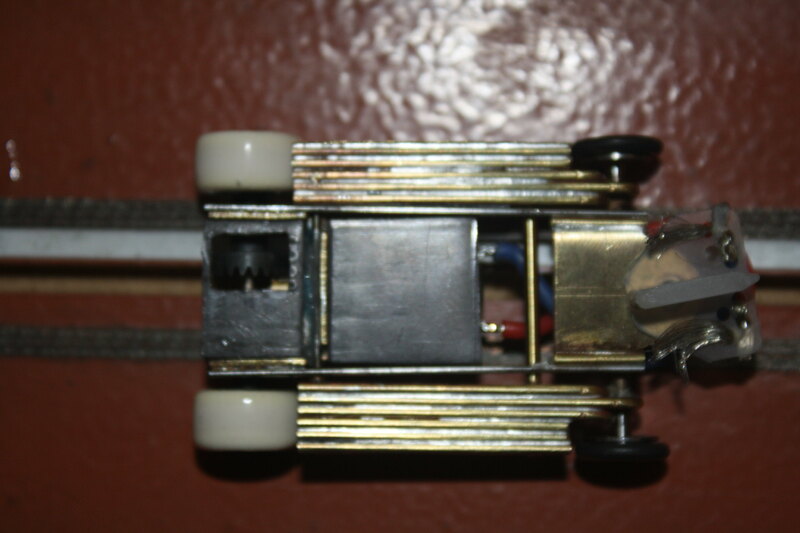 The birth of the Micro-Cuc goes well back into the 60's with the Cox LaCucaracha that featured an isofulcrum chassis. 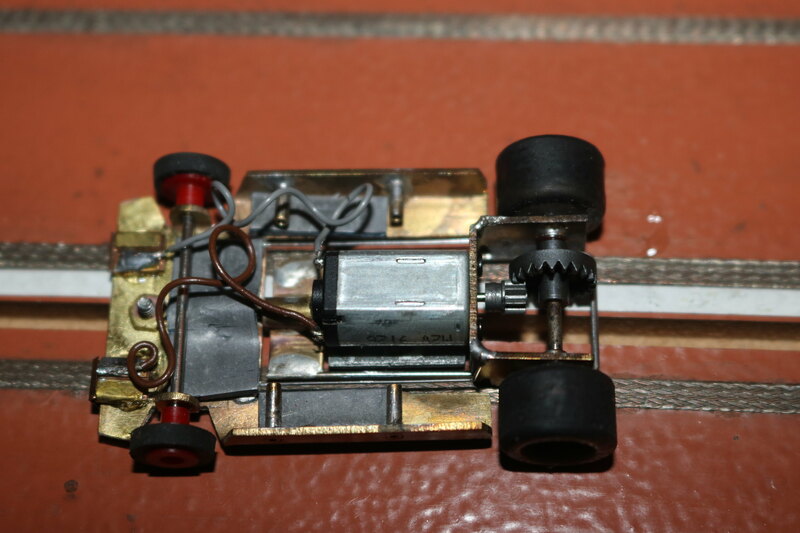 I went on to have good results with that type of chassis in both 1/24th and 1/32nd scale racing using both commercial and hand-fabricated brass chassis. I was also aware of Ed Bianchi due to his contributions to the various model car/slot car magazines of the day. After some correspondence, and I don't even remember what started it all, Ed and I finally got to meet at his PA home in what had to be the early 90s. At the time, Ed was working on a direct drive prototype that incorporated a simple pan type of chassis with a floating weight. 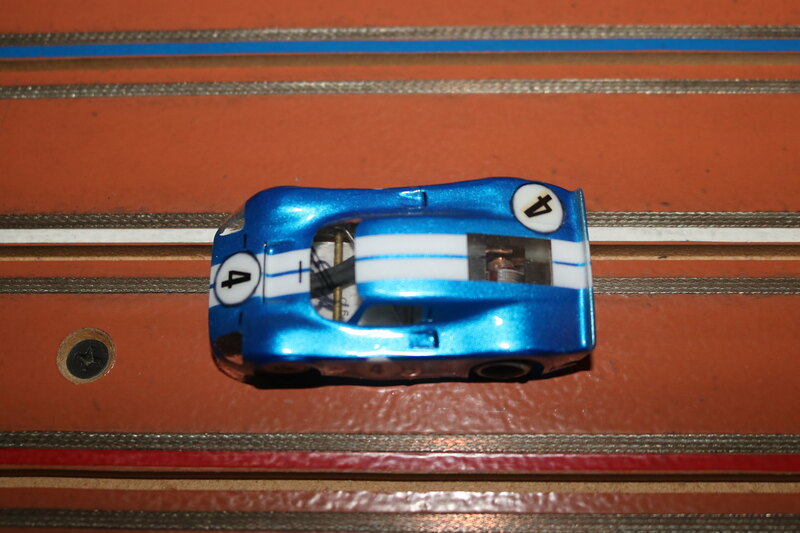 The car was blazingly fast and drove unlike any other slot car I had ever run. The 5-hour drive back home gave me plenty of time to think about ways of possibly doing this prototype one better. Hmm, I'd always had good luck with an isofulcrum chassis, so would a direct drive HO-sized isofulcrum chassis even be possible? 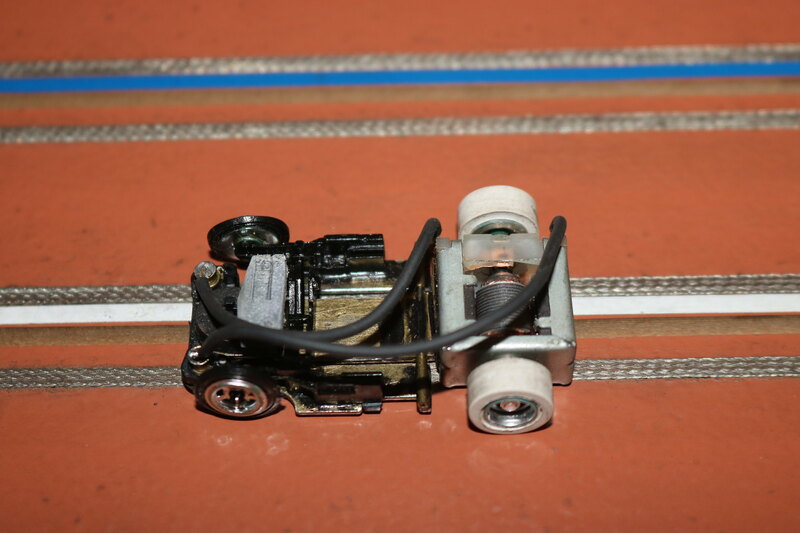 Following is a photo of a bare chassis of what became the "Rattler". I don't know if this is one of Ed's prototypes or possibly a MkII version. Ed will have to chime in to confirm where this chassis fits into his production line. The design is simplicity at it's best. 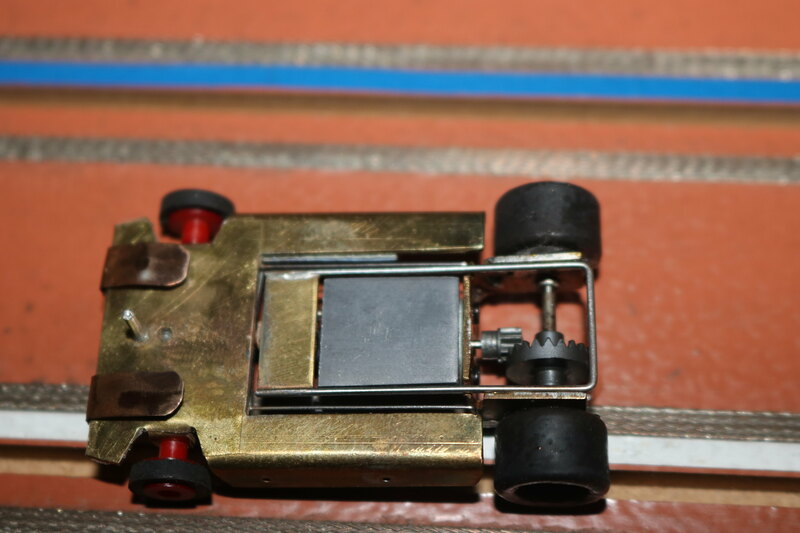 By the way, the "Rattler" got its name while I was testing a prototype on my home track and my youngest daughter wandered by and declared, "That car sure is a "Rattler" due to the noise that the floating weight makes as it moved in/against the pan chassis. 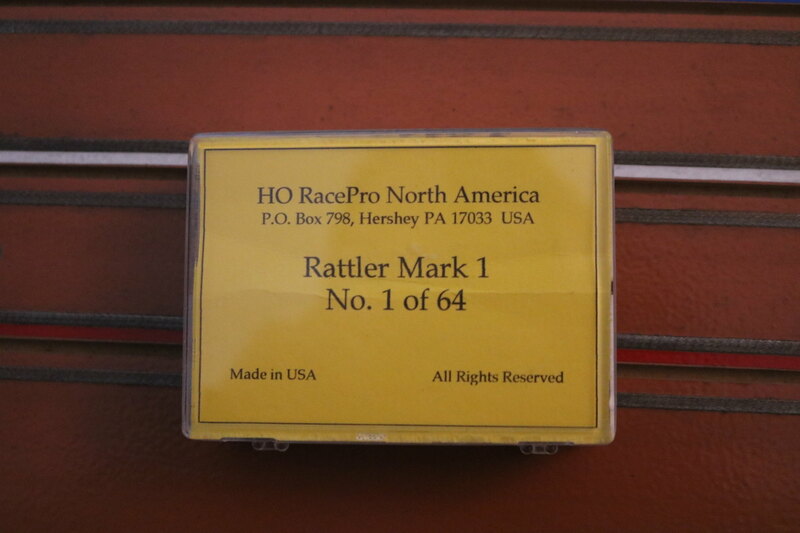 As a result, Ed presented Rattler Mk I serial numbers 1 and 2 to my daughter and I.
OK, now that I've rattled on enough about the "Rattler", let's get back to the Micro-Cuc family. The first Micro-Cuc proof of concept prototype was actually fabricated from a Tyco Pro that gave its life for the project. After being all chopped up and assembled with Lok-Tite Black Max reinforced CA super adhesive, the concept showed great promise. You'll note that almost every component of the Tyco Pro was used in some way. This chassis still exists and runs well. 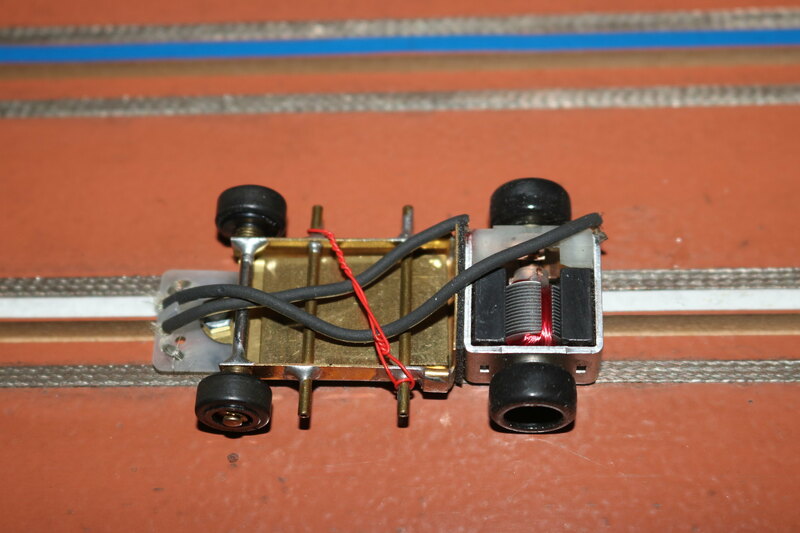 This chassis test mule showed enough promise that I hand-fabricated two brass versions, one for myself and one for Ed. 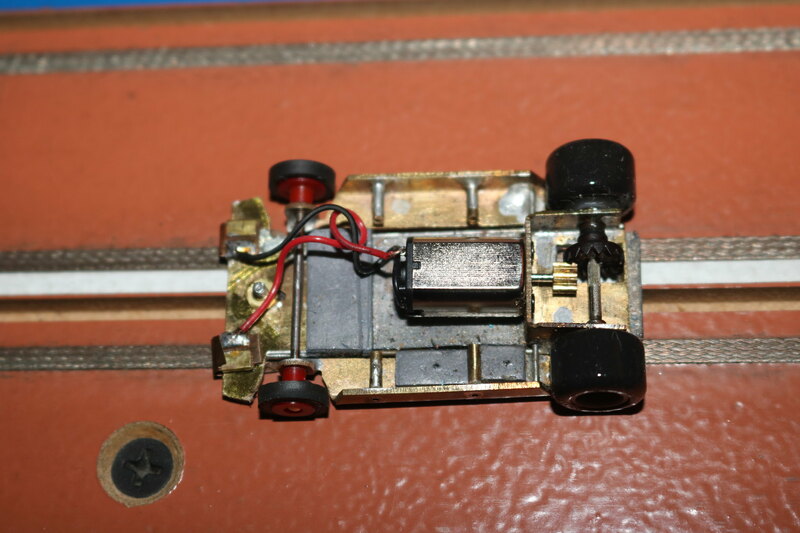 Ed decided to write a review of this chassis and published it on one of the slot car Bulletin Boards where it took on a life of its own with many people requesting one for themselves. The prototype was never intended for serial production, so I ended up developing an assembly jig and using a construction sequence of 3 different melting point solders. The end result was the Micro-Cuc II of which 354 were fabricated and shipped as far away as Australia. 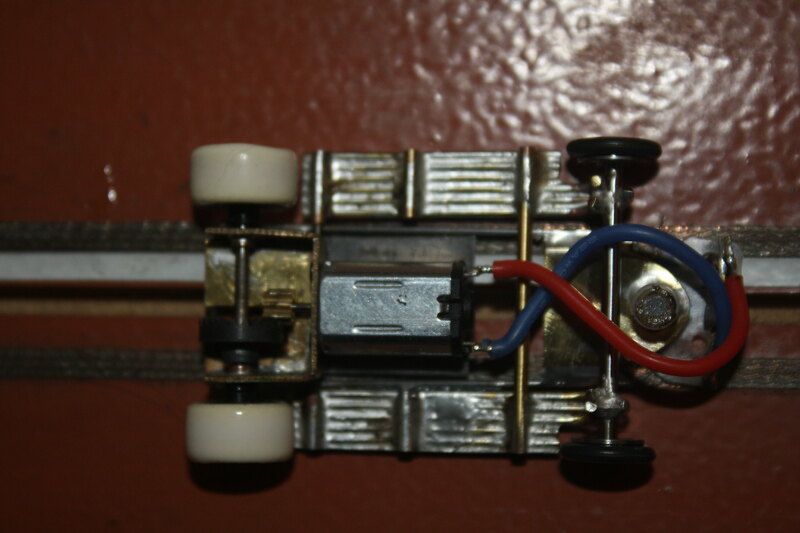 This chassis became somewhat of a dead end, as it didn't fit into any existing racing classes at that time. Fast forward a whole bunch of years and you reach the point where fabricated brass cars are coming back into vogue. Call it retro-racing, gravity racing, and all of a sudden what was old is now new again. But it's even better than that, as people such as Al Thurman and Joel Pennington and other notables have jumped into the fray with their own evolved, advanced creations. HOCOC (HO Circuit of Champions) decided several years ago to give this class a try. Calling it our Unlimited Class, our rules are quite simple: one guide pin/flag, all four tires must touch and roll, and has to fit through a standard tech block. 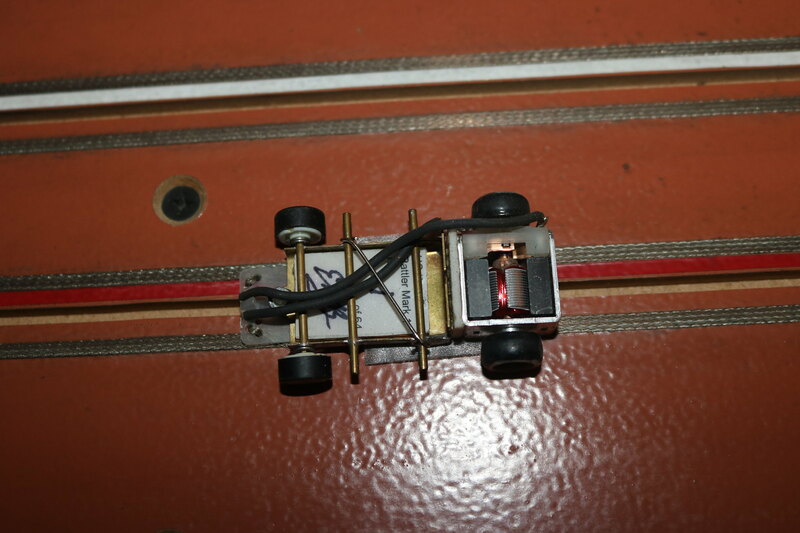 All of our races for this class are on routed wood tracks fitted with non-magnetic braid. No "Lift Pin" tests for us! After about 6 itterations, the Micro-Cuc III was born. This chassis used typical late 60s construction techniques. 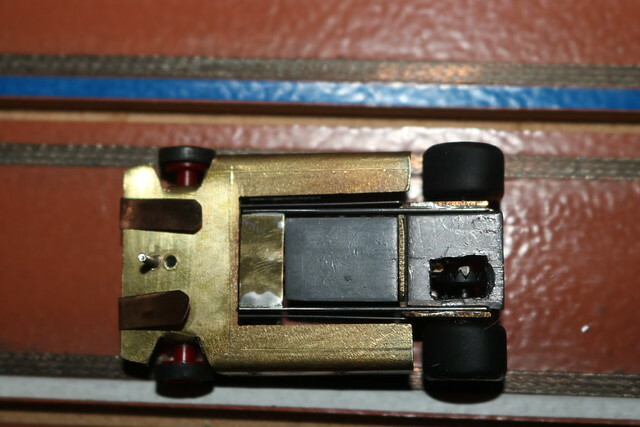 Intended for use on our banked oval tracks, this chassis is geared at an aggressive 8/15. It's fast as a bat out of Hades, but has no brakes to speak of. 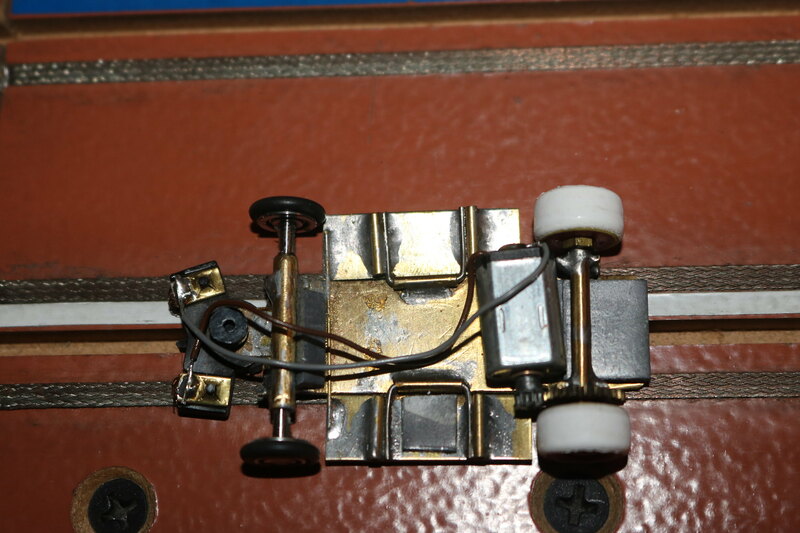 Looking at the photos of the naked chassis, note that the reinforcing plate in the motor/axle bracket is recessed. This allows a pocket for a lead weight. With the motor mounted on the center line of the rear axle, there is enough room under the motor for another lead plate. This keeps the center of gravity as low as possible and presents a good weight distribution. The independently rotating front wheels are actually ball bearings fitted with "O" rings as tires. Note that this chassis is set up to use a "Slide Guide" (tm). This guide flag, available from HORacePro, comes in two versions, i.e., one for conventional routed track with an 1/8" slot and one with a thinner blade for a 1/16" slot. The thinner blade also works well in a conventional 1/8" routed slot. 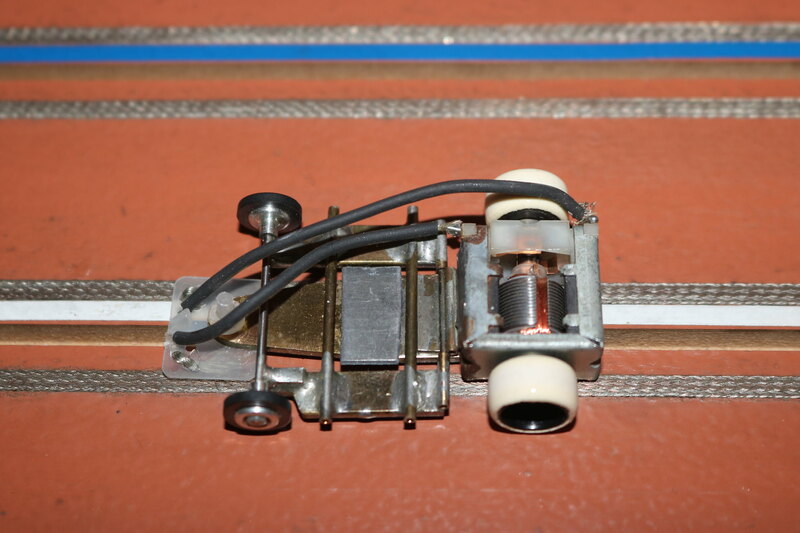 The resulting chassis was fast and very competitive. But as always in racing, there was always the nagging thought if I could do better. Last edited by GMCullan; 10-31-2018 at 06:17 AM. Seriously looking at the design parameters that help raise the performance of fabricated gravity class cars, the major considerations appeared to be tires (soft and grabby) and controlled flex in both the pitch and roll axis. The Micro-Cuc III basically had no flex in the pitch axis and only very limited flex in the roll axis. Flex in the pitch axis contributes to forward bite while flex in the roll axis contributes to side bite. And like anything else, too much flex can be as bad or worse that not enough flex. 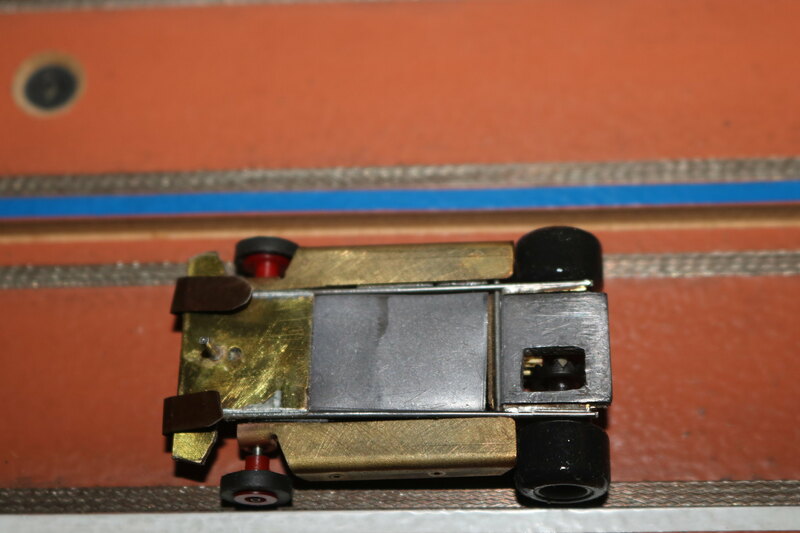 Looking at the current state of the art across all slot car scales, variations on a center hinged chassis/rear pod seem to be doing very well. That being said, I did stick with the isofulcrum platform for one more chassis. Al Thurman of LandShark fame sells the chassis components to allow the construction of his various LandShark cars. These components make excellent starting points toward your own unique builds. Readily available and reasonably priced, in modified forms, allowed the construction of the Mico-Cuc V. Oh, what happened to the Micro-Cuc IV? Hmmm, there are some things better left undiscussed. Back to the Micro-Cuc V. This chassis featured thinner music wire for more flex in the pitch axis as well as about 0.010" flex in the roll axis. 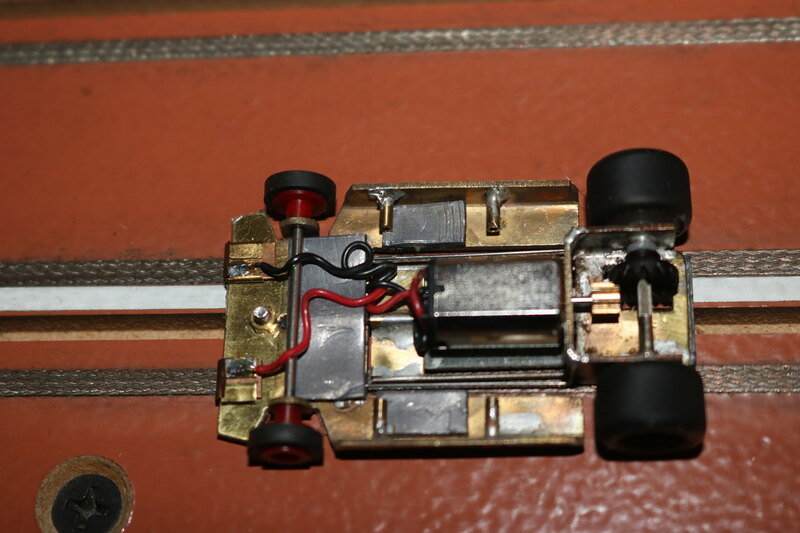 This chassis also went away from the Slide Guide (tm) and went with a more traditional guide pin and wipers for pickup shoes. Geared 8/15, this critter was a beast on our banked oval. This resulting chassis was unnervingly fast, just about everything I could hope for. But could I do better? I do believe at this point in time I needed to leave the land of the isofulcrum chassis and journey to the land of the center-hinged chassis. And once again, LandShark components came to the rescue. This chassis has, at least to me, some interesting features. 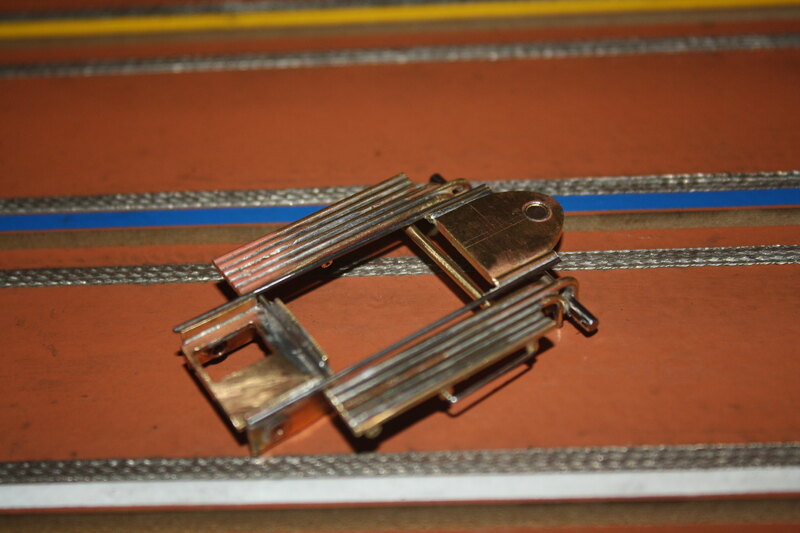 First and foremost are the two sets of fore/aft piano wire elements. The thicker of the two sets ties the motor pod to the rear portion of the center hinge. 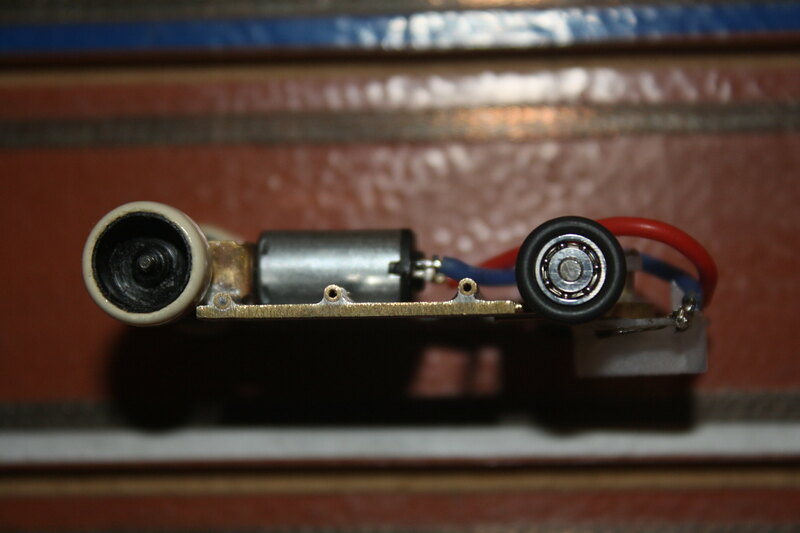 The thinner wires tie the motor pod to the forward portion of the center hinge. This is where it gets interesting. 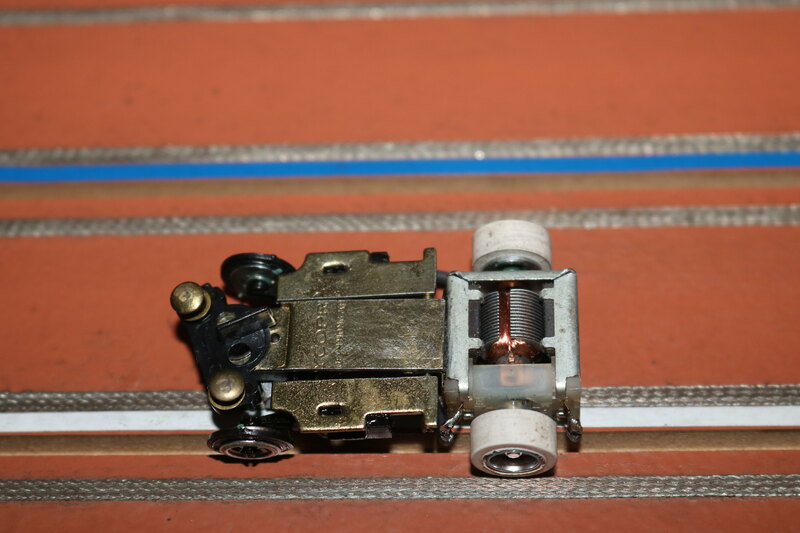 The thinner wires so not connect to the lower portion of the motor box, but to the top of the motor box by means of 90 degree bends. 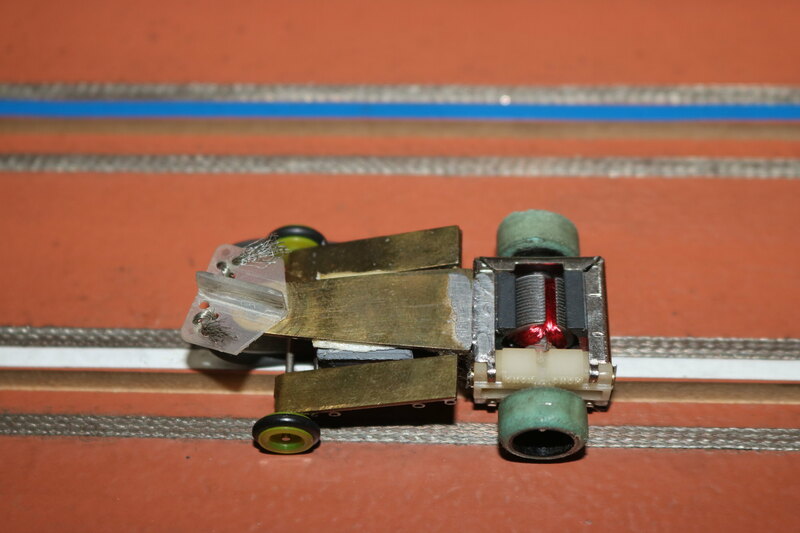 The thicker wires control the majority of flex in the pitch axis while the thinner wires contribute to controlling flex in the pitch axis while having primary control of flex in the roll axis. And due to the push/pull arrangement of the 90 degree bends presents a sort of anti-sway effect to the flex in roll. Geared 8/15 with a small neo magnet can motor, this was a beast on the banked oval. Just having to try it on the Banzai BuckTrax road course, it was almost undriveable. There were zero, zilch, nada, no brakes at all. So a second version was built with 7/24 gearing, slightly different wire sections, and a different weight distribution. This one turned out quite nice as a road course car. As mentioned earlier, there were several dead ends during all this building and testing. While the Micro-Cuc IV will not be discussed in polite company, I do have one not so bad attempt that I will share. 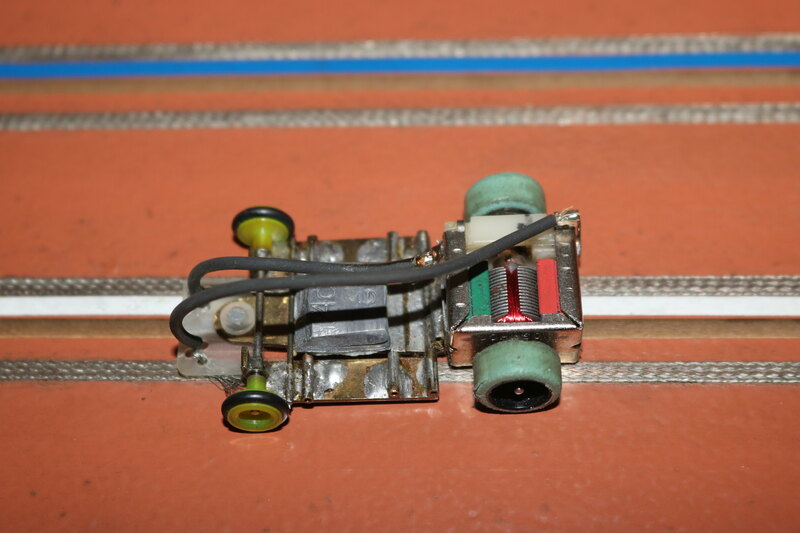 A somewhat common vintage slot car design uses "bat pans". These are hinged sections coming off of the sides of the main pan. So for the fun of it, I threw together a little anglewinder with bat pans. 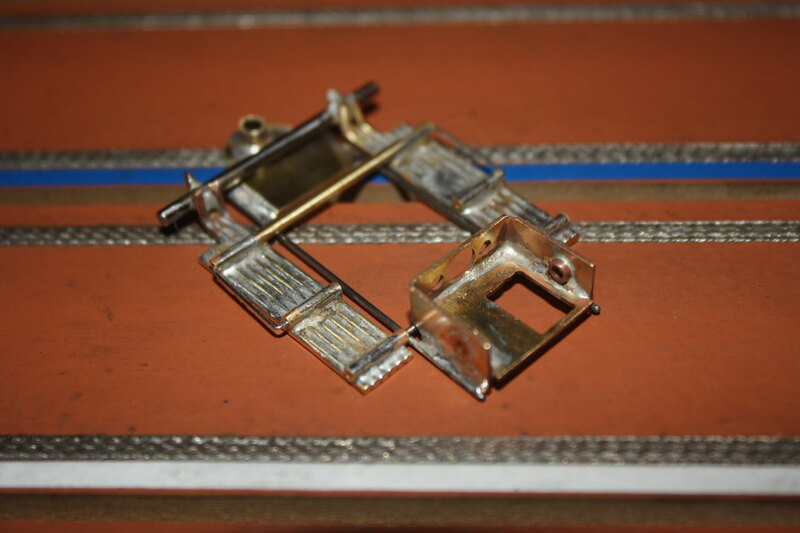 Note that there is a small section of spring wire at the front of the pans so as to control their flex. This spring wire is only soldered to the pans, not to the chassis. Well, that's about all for now. I hope you enjoyed the read! Last edited by GMCullan; 10-31-2018 at 06:21 AM. By the way, this type of racing is proving very popular here in New England with HOCOC, MARC, and GRoNE (Gravity Racing of New England) holding regular races for this class of cars. I apologize if I have missed mentioning your organization. While I've presented my way of involvement with this class, other builders are making some incredible works of racing art. In particular, one MARC member makes a center hinged anglewinder that is a little jewel. I believe that he has documented the construction of this chassis on the MARC web site. 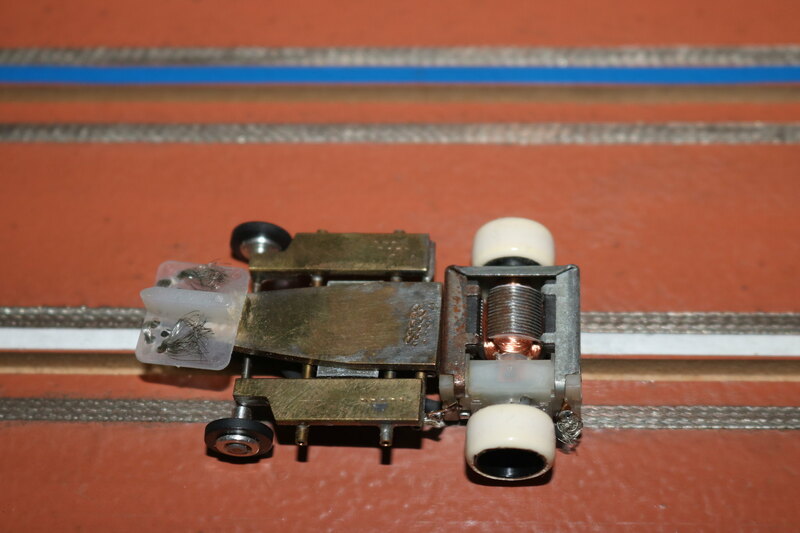 So break out the soldering iron and solder, cut some brass, and have a great time creating the race chassis of your dreams! Knocked you out of the slot!